Pictured leaving port in 1959. As a child I spend many happy times in Newhaven which was the birthplace of my mother Kathlyn Clarkson (Pargeter) and where my Aunty Margaret Pargeter lived virtually her whole life. This page was added by Adrian Clarkson on 09/03/2016. 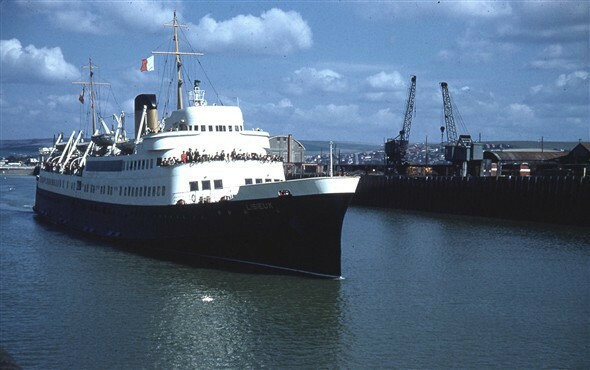 What a great shot of Lisieux in her heyday departing from Newhaven - many thanks for sharing it. Cracking photo! Colour shots of Lisieux are quite rare. From the lighting angle we can tell that this is the morning departure and you can almost sense the excitement and anticipation that the day trippers and holidaymakers packing the 'balcony' must have felt.